The concept behind this Yamaha scooter is the NEC or New European Commuter. A combination of high cruising speed and convenience is what makes this scooter special. Liquid-cooled twin 2-cylinder 499cc engine is layed down flat, below the rider's feet, central between the wheels. 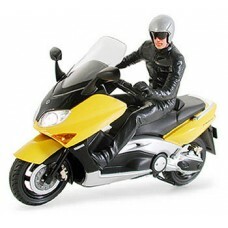 The TMAX boasts a 160km/h top speed. And what's more, Yamaha has made every effort to make the scooter ride with the balance of a motorcycle. The weight distribution is 47% front 53% rear, much closer to the 50-50 balance of a super bike than any other scooter where the rear mounted engine puts excessive weight on the back wheel. With ample storage space under the seat, this scooter has excellent touring potential, and proves to be balanced, powerful, convenient and fun. Its unique form allowed the Yamaha TMAX to be awarded the 2001 Good Design price. Snap on kit, requires no cement, no paint! Snap on parts make this kit easy to put together and cement unnecessary. This kit is perfectly suited for beginners who will be able to achieve easily a realistic model. Color distinction true to the real TMAX makes painting unnecessary. 1/24 Scale, Overall Length: 93.5mm, Overall Width: 32mm. The unique form of the TMAX has been faithfully reproduced. Yellow colored body cowling, black-colored chassis. Color distinction true to the real TMAX making paint unnecessary. Screen and headlight are reproduced with clear parts. Taillights reproduced with clear red, and blinkers are reproduced. Snap on parts easy to put together.